Riffing on LaMa's entry below, i decided to include a picture of part of my craft space. 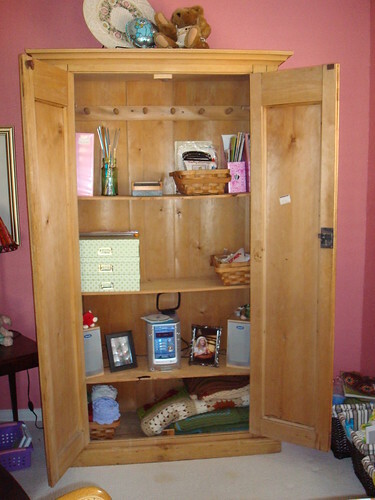 This is a pine armoire, which has been repurposed from one kind of storage to fit into my craft room. Actually, I think I'm going to start calling it my studioffice--a term I saw on a beautiful blog the other day. While I had every intention of keeping my office stuff away in another part of the house, it just keeps migrating back into here. If that's the way it's gonna be, then it's better to just deal with it and move on! I'm still working on storage solutions for all that stuff. I LOVE this armoire. When I'm working in the office, I leave the doors open, because it has my stereo in it. But when company is coming, I can shut the door and it looks so much neater. Like LaMa, I have vases full of crochet hooks and knitting needles, a pencil box painted by my mom that holds stitch markers, tapestry needles, small scissors, etc. Then baskets that hold THINGS. Finished objects are on the bottom shelf--well, at least the ones that aren't in my closet! There is one of my favorite pictures of Zman, taken when he was still a little Zkid. You can't tell, but he has on a Daniel Boone coonskin cap and he and his buddy have play guns and are pretending to be mountain men of some type. There is also a beautiful picture of McKid's first communion. Lovely. I change out these pictures every once in awhile, and put something different there. Sitting on top is a plate that I painted with pink roses and floated lacework. The artist bear that my dad got my mom and a balloon that says "It's a Boy!" that was in a flower arrangement I got when Zman was born. Yes, this little mylar balloon thingy is still as full as it was in the beginning, 24 years ago! So, there's part of my space. Maybe beautiful only to me. But beautiful nonetheless. Oh, no. I'm a decorative painter--from patterns, etc. Not an artist. A craftsperson only. This page contains a single entry by MamaT published on June 3, 2010 10:20 AM. Thursday, Beautiful Thursday was the previous entry in this blog. I am such a sucker for lists.... is the next entry in this blog.